Our library currently includes 28 baby carriers, and we are adding new carriers all the time. 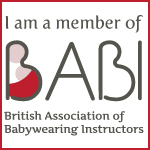 We have examples of each of the 5 main types of baby carriers – stretchy wraps, ring slings, woven wraps, mei tai and buckle carriers – covering many of the most popular brands. So there is plenty to come and try on and learn more about! For the full list of what we have, and how much they cost to hire please head on over here. PS! The eagled eyed of you will have noticed the picture above only contains 24 carriers! I have discovered its almost impossible to take a picture of everything – there is always something out on loan! At the time of taking this picture we have two stretchy wraps out on long term hire with families with newborns (in one case a family with newborn twins), a buckle carrier being trialled by a family with a 2 week old and finally one woven wrap has gone on holiday with a family who didn’t want to take a buggy for their toddler through airports etc. Which is a fairly typical week for the library! Announcing our first Sling Library dates!